From the Jensen FF Mk1 sales literature: ” Chrysler 383 engine 90 degree Vee 8, O.H.V. with hydraulic tappets. Crankshaft. Fully balanced, 5 main bearings. Lubrication System: Externally mounted rotor type pump with combined full flow filter. Paper element. 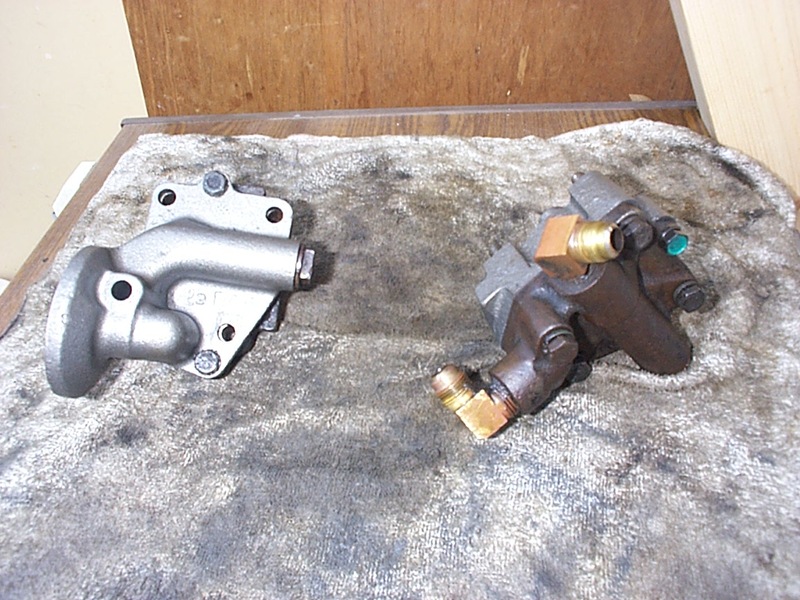 Photo 1& 2 oil pump location. 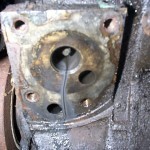 Photo 3 engine mounting point for oil pump. Photo 4 oil pump as removed from car( I found it easier to remove the hoses at the oil filter. Photo 5 comparison of old and new pumps Photo 6: ……………….Photo 7: location of pressure switch and oil feed to oil pressure gauge. I had a problem relating to oil pressure loss which eventually ended up with me getting 2 bent pushrods. 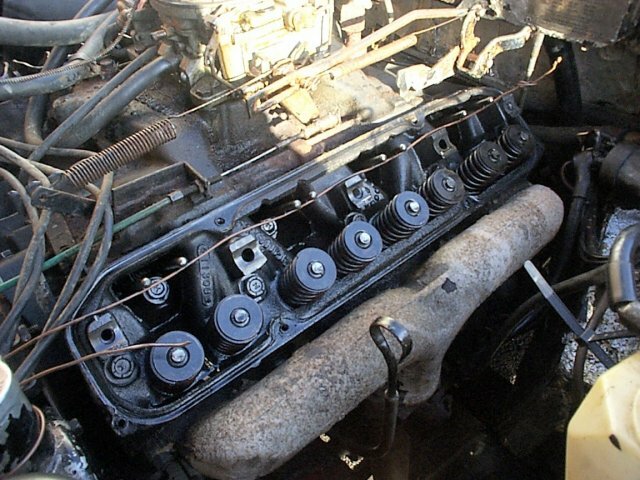 …………..I’ve been recommissioning an FF (with Chrysler 383 engine no.1801/19E). I’ve had the engine running in the car, on the driveway, with 50 plus psi oil pressure for a few weeks now. I took the car out on the road for the first time ( just a few short runs up and down the road outside the house). Big smile on my face ,when suddenly the red oil pressure light came on and the oil pressure gauge dropped to zero. Big smile now gone. I think the pressure gauge is of the capillary tube type so given that both the electric red oil pressure light and the physical oil pressure gauge both show a problem I think it’s reasonable to presume its not just a technical fault. I’ve checked the oil pressure relief valve and that doesn’t seem to be a problem so I’m going to remove the oil pump. 2. Any general advise when doing this job? ……………….Someone else had suggested that I needed to take the sump off to check to see if the feed tube/strainer had fallen off. However, having removed the oil filter from the canister I was able to visually confirmed that it is pumping oil, so conclude that the oil feed/strainer is in place. the senders and will flushing do the job.? 2. What else does this oil passageway feed. ……………. I checked the pressure relief valve first. Then bought and fitted a new pump. Removed the drive through the distributor hole. All OK.( much to my surprise). I took the oil filter out of the housing and watched the oil feed into the filter housing. I have concluded that, Given it was stored for some 12 years something has dislodged and blocked one or more? of the oil passageways. I’ve tried 40 psi down the oil pressure gauge hole in the engine block but still no oil coming up in this area. What does this area feed oil to. 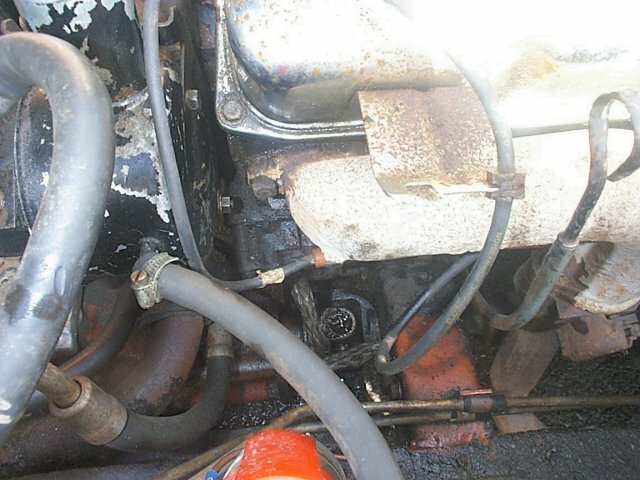 ……………Does anyone with an intimate knowledge of this engine know where the oil passageway, that feeds the pressure gauge and sensor, on the 383 come from, and what is it feeding apart from the gauge. I am particularly worried it is feeding the rear main bearing? …………..Its all gone from bad to worse. I had removed and replaced the oil pump/distributor drive. Found it was OK, replaced it and then reinstalled the distributor (the drive, however, must have been out a notch). 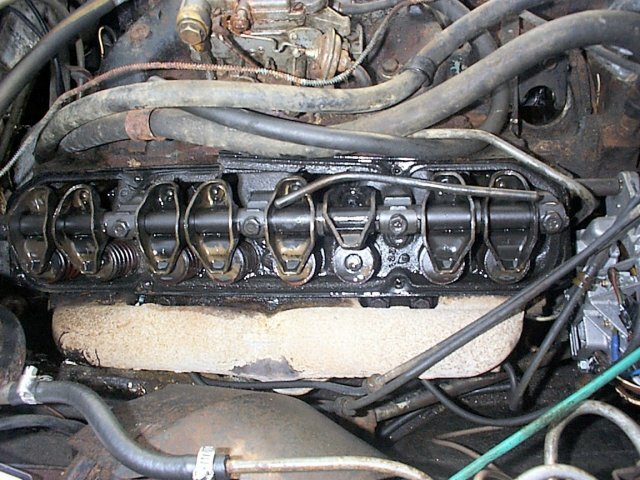 I put flushing oil and a new filter in and then removed the rocker covers with the intention of starting up the engine to see if the was oil getting to the rockers. Turned key. Engine misfired badly (ran nicely before). I found I had bent the No 4 cylinder intake pushrod and on the opposite side, the No.1 intake pushrod. So I can’t start the car now. I feel the damage to the pushrods must be due to my actions with the oil pump/distributor drive and not the oil loss problem. This belief is based on the fact that I remember reading somewhere that the pushrods can jump out of position. But I’m not sure what this was in relation to. Is this possible or am I now clutching at straws. …………….Following some excellent advise from those on the list I have dismantled front end to disclose valve timing chain. Nylon sprocket type and the chain was very slack and had slipped. I am hoping that the damage might be minimal (i.e. two pushrod) given I was not actually driving anywhere. 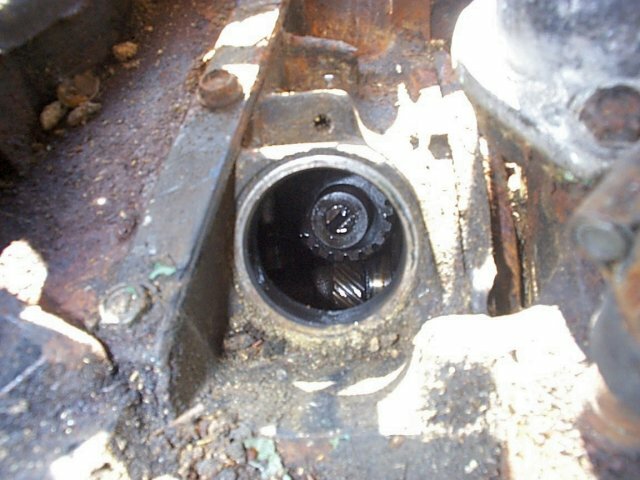 I am also hoping that when I remove the sump to gain access to the oil take up I will find it blocked with nylon fragments. 1. Turn over the oil pump with an electric drill and hex rod, passed through the distributor mounting hole, to see if I have oil pressure back. 2. Compression test the cylinders, by turning engine over on starter motor ( if I have oil pressure) to see if I need to do the heads. 1) I would not start that engine again, at all. I would only test oil pressure using a pump priming shaft. 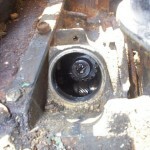 There is also a shot of the oil pump priming shaft, at the very front off the picture. This hex shaft goes in a cordless drill, and lets you test oil pressure without starting the engine, prime the engine after a lay up,etc. You remove the timing gear/pump drive, drop the rod in the hole, and start the drill for a bit. I bet Jegs would send you one for 20 dollars or so inc. post. photos of top of oil pump/distributor drive ( after removal of distributor) and the shaft as removed. This drive shaft is is simply pulled out to allow the priming shaft to be inserted. 3) To save yourself time and money follow these steps. Take the heads apart, and take them down to a machine shop. Have a complete valve job, magnaflux the heads, put in new titanium valves for unleaded fuel, put in new hi-performance push rods, lifters, and steel rocker shaft. 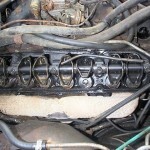 Also replace the valve guides and put in new teflon seals. You will not have a problem after you put it back together. 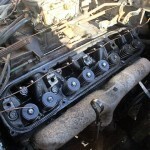 Also, replace the cam with a new performance cam, and roller timing chain and gears. $700US to $1000US for the complete job. You will be very happy with the results, and not have to take it apart again. Take this from experience. 4) OK I’ll be the one to break the bad news to you. Seeing how I’ve had this happen before and I’ve tordown a few with the same problem. If the chain went by by and you bent push rods that means you probably bent valves and hurt the pistons. What happens is the valve opens hit the piston bends the valve and pushrod. When the piston hit the valve the valve leaves a nice notch from the valve face which in turn creates a spot for the piston to eventually burn a hole into the piston. If your going to do the chain you may as well pull the heads off and take a look. If you find bent valves and nicked pistons Pull the engine and do it right. 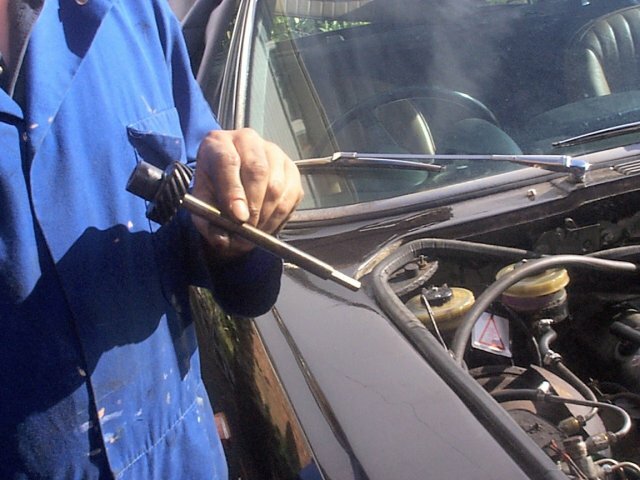 6) don’t see any way that a miss-aligned distributor could bend pushrods. I think your problem is a bit more severe than that. I’d check the cam to see if it hasn’t sheared or your timing chain hasn’t disintegrated or skipped a tooth. 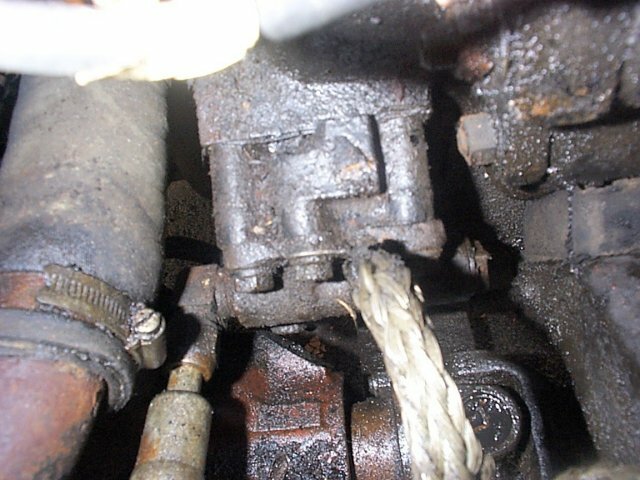 Two bent pushrods is a sign that something is interfering in the valve train, and the distributor is run FROM the cam, not the other way around. Pull the timing chain cover and check the chain/gears. If they are nylon coated, you may see that they aren’t anymore and the chain has slipped. If they look good, pull the gears, loosen the rockers, and try to pull the cam out. Hate to say it, but if you bent the pushrods your valves may be toast. 8) Come to think of it, the last link in the oil-feed chain is (per memory) the left hand main oil gallery, which feeds the timing chain area. If the nylon gear is left sans lubrication I can well imagine that the remaining teeth will disintegrate very rapidly indeed. When I dismantled the Int engine I was surprised it had kept its timing intact, there wasn’t a lot left. 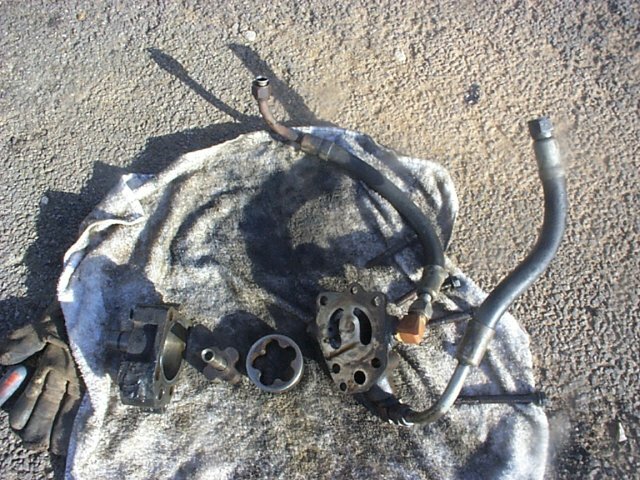 10) I think that you might have put the distributor drive one notch out, and that the miss fire took up the chain slack (due to missing nylon teeth) in unusual ways, and bent the pushrods. 11) There is a picture of the windage tray in the JOC mag, that long flat tin item. It is just a baffle that goes in the sump, to stop the crank from stirring up too much oil & causing bubbles, etc. 12) If you have a windage try you need 2 sump gaskets. One goes between the engine and tray the other between the try and sump. 13) In that case I would check the bypass valve next (as suggested by others on the list). 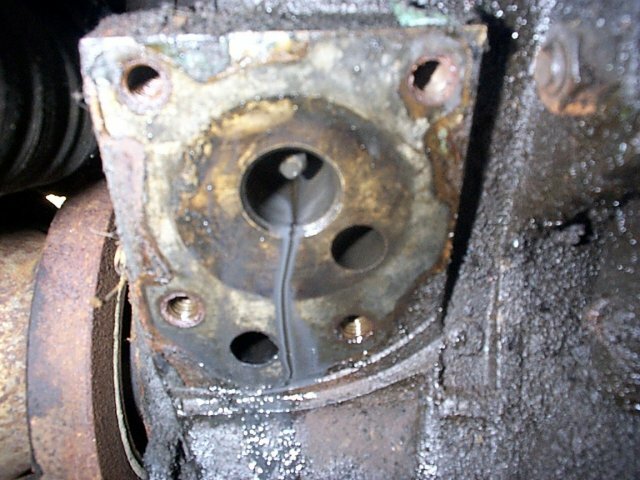 The suddenness of the loss points in that direction, alternatively to a damaged oil pump drive. I can’t remember if you have removed the oil filter cover and filter to observe if oil is pumped into the filter housing? 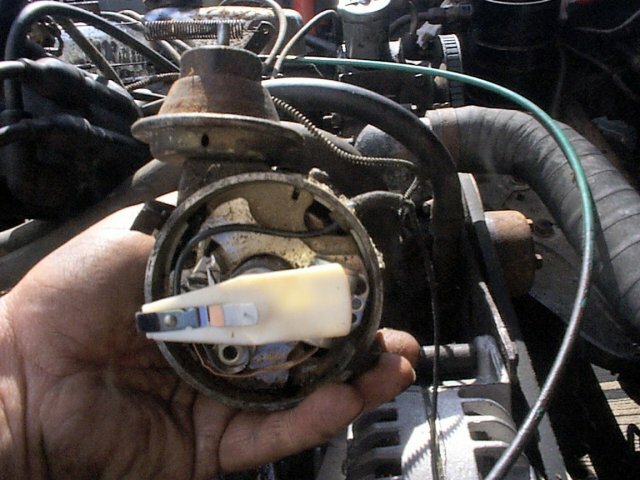 oil pickup (in the pan) is most likely clogged with the old nylon gear teeth and cannot generate more the a few psi. The gauge path is from the cam shaft oil passages, which get their oil from the mains gallery. I have rebuilt many 383s and 440s, and can say that at this point your best bet is a motor removal and refreshing. The damage has most likely already been done! 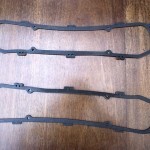 At a minimum the pan and timing cover will need to be removed and the proper parts replaced! Good luck (its actually very easy on these motors)! 15) In that case check if you get oil to both rocker shafts, as you say. If you do there’s oil reaching most places I would think. The pressure gauge is connected to the oilways connecting the left and right main oil galleries. The rocker shafts are fed via one of the camshaft bearings, which in turn is fed from the right main gallery. In conclusion, if there’s oil at both rocker shafts, my bet is on the relief valve being stuck open. 16) From experience: It does happen that the oil gums up the tube and/or gauge. It behaves as if there’s no pressure at all. 17) Fitting an upgraded pump means you really ought to fit the hardened pump drive too, as more pressure will be put on the drive. In my experience, the drive normally snapps due to a blockage in the pump. Check for score marks on the impellers of the pump. Pumps are very cheap, so make sure you buy the best, which will only be 5 or 10 pounds more. I would clean out the sump and fit a windage tray.You may need to loosen an engine mount and slightly raise the engine to get clearance to fit the high output pump. 18) You may want to check the oil pump drive shaft that also runs the distributor, the oil end of this can shear and when this happens you loose oil pressure, Mopar sells a performance replacement and also a high output oil pump which are both worth getting, but remember to save the old bottom cover of the pump you will need it for the Jensen. 19) It could be that the broken nylon teeth from the timing gear have accumulated to such an extent that they are blocking the oil pickup tube. My car had quite a few of them in that slotted area of the pickup tube. I had to fish them out with my little finger. It won’t hurt to look. Heartened by a couple of response I chose to just replace the 2 bent pushrods. It was suggested to me that I could use a wire to keep them all in place when re tightening the rocker shaft.The Big Block Mopar engine book suggests you take the old pushrods out and turn them round I you are going to reuse them This I did, however, I didn’t break the seal (hydraulic -between the pushrod and lifter) on one of them and accidentally pulled the lifter straight out. I had one of those magnetic pick up rods for screws etc. and I was able to just pick it up and put it back. If I had known how easy it was going to be I wouldn’t have cussed so much. Copy of an article produced in the White Lady dealing with problems with the nylon coated camshaft sprocket. My thanks to \\David Crown for the article. Two new push rods were also purchased. “It is possible to remove the sump on an FF”. 2. Taking off the sump is an easy job on an FF. The crossmember needs removing, but that is all. 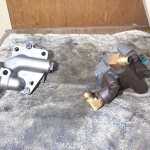 The larger oil pump does fit the FF, but you will need longer bolts too as I recall. It is more tricky to fit, but does clear everything when installed. 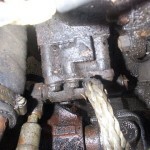 There is a cross member towards the back of the engine, under the gearbox/engine joint. If the gearbox is still attached to the engine, and the mounts are OK, This can be removed after taking out the 4 bolts, and (I’m almost sure about this) the starter too… There is a prop shaft support bracket, and I think this may need to come off/be moved. As I recall, there is no problem at the front end of the car with the front subframe, once you have the space to move at the back end. Photos 1 & 2 o- underside of FF engine showing sump . 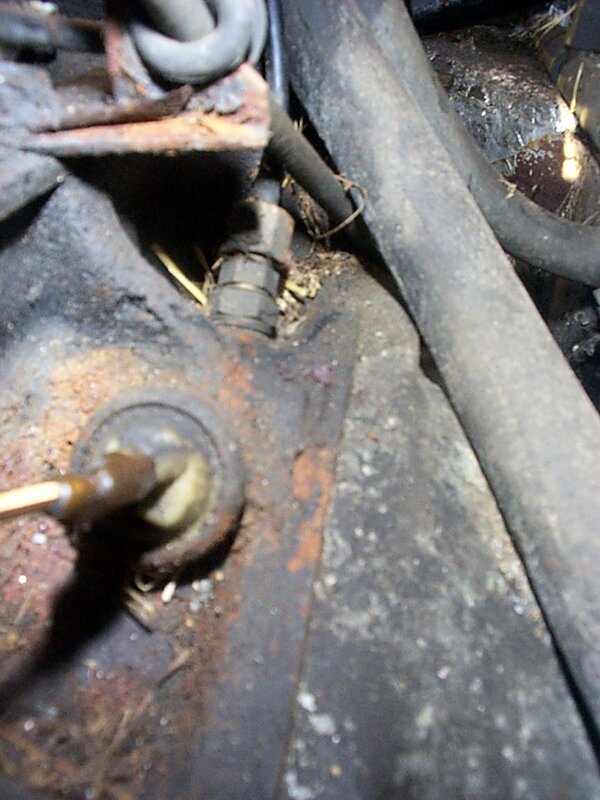 I needed to remove the engine oil sump.Photo 3- shows removal of rear cross member. Photo4 – shows the the prop shaft support bracket. The propshaft is supported by a bracket on the propshaft and a bracket on the autobox joined by two”cotton reel” type mountings I removed the two bolts holding the mountings and also the lower of the engine bracket bolts. This allowed me to free the propshaft and move it sufficiently sideways to swivel the rear of the sump and allow the front of the sump to clear the front crossmember and drop down clear of the oil strainer and engine. Photo 5 showing the windage tray which I understand is standard on the FF.This tray can only? 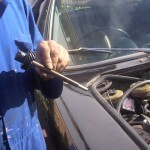 be removed after the oil strainer tube is unscrewed. 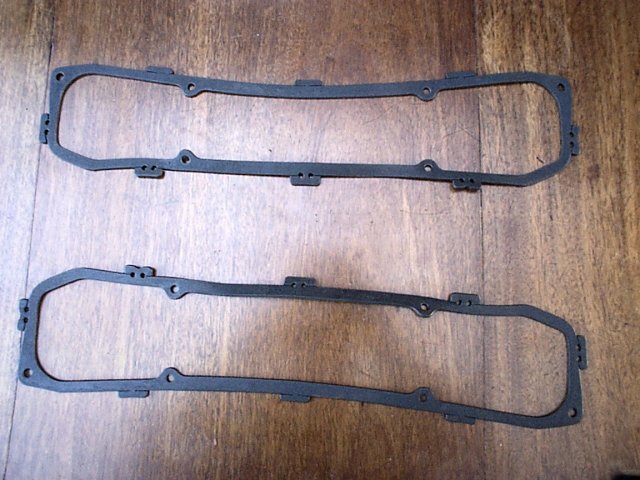 You need two sump gaskets because of the windage tray. 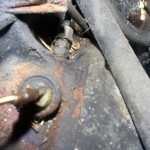 Photo 6 shows the crank and the unfastened propshaft support bracket. Photo 7- The top and bottom rubber bushes sporting the propshaft as seen in photo 6 were perished and replaced by 2 new bushes obtained from Cropredy Bridge garage. This photo shows the old steel inner part of the ash and the replacement new rubber. It all goes together quite easily. Photo 8 I had to remove the small cover plate to the auto box and tie up the front propshaft to drop and then rotate the sump and then gently? force the sump to come out of its confines. Took me about 2 hours of mental and physical effort to get it off. 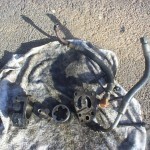 Photo 9 – is of the windage tray and sump after removal. This is caused by oil surge allowing air into the pickup. Sometimes pressure will not come back because the pressure relief valve sticks open. (Cured by undoing the large nut on the oil pump and pushing hard on the valve to re-seat it). A stronger spring will overcome this tendency to stick open which can happen at other times too.This stronger spring is the black one? and can give readings in the 80lb range too. The pressure loss can be due to low oil level and in some cars even the full level isn’t enough to stop it. Try an extra half litre in the sump. This is usually enough to stop pressure drop when braking very hard or on fast cornering. 1. Hot idle oil pressure in a Big-Block can be as low as 15 psi without fear of damage, so long as the pressure builds instantly off idle. 2. For the health of the bearings a B-Block needs 10 psi for every 1000 rpm of engine speed. Thus 30 psi is OK for 3000 rpm, 50 for 5,000 rpm and so on. 50 psi running is plenty; if you’re using more than 5,000 rpm frequently, with the reciprocating mass of that motor, your risking big end bangs anyway. I’ve just fitted the high torque starter motor. The old one simply unbolted and I withdrew it upwards through the engine bay ( possible on the FF, but not, I think, on the Interceptor). I had to modify the bracket that supports the front propshaft but that was all. After disconnecting the battery I used a 1/2 inch spanner to undo the terminal nut on the starter motor (attaching the thick live wire from the solinoid),then a 5/8th inch spanner to remove the top bolt holding the starter motor in place. I also needed to remove the 5/8th bolt holding the front propshaft support bracket before I could access the bottom starter motor bolt.The bottom starter motor bolt is tucked into a small space and needed a 5/8th socket to reach it. I tried to remove it from underneath and found the front propshaft in the way. 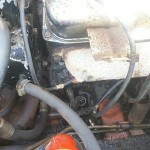 Then discovered it came out easily from above past the exhaust manifold. Here is a comparison of the two motors This phot shows the new starter motor in place .The solinoid coonections are very close to the engine block. 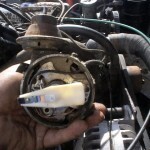 the photo also clearly shows the jump wire needed with this starter motor. Cropredy provided the wire at the time of purchace . Putting it all back together looked easy except that when the new high torque motor was in place I could not reconnect the front propshaft support bracket bolt. I had to remove the bracket and grind down part of it to make it fit.